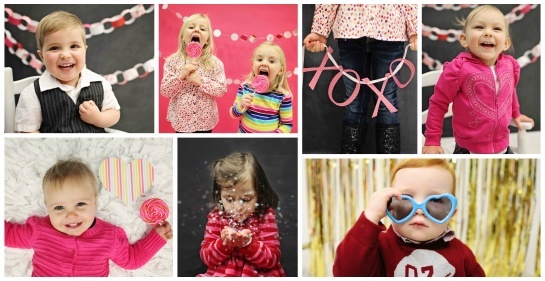 These valentine photo ideas will help inspire you to snap adorable pictures of your loved ones! We invited a bunch of kids to Pear Tree for a photo shoot, and created this video so we could show you some fun photography tips for Valentine’s Day that you can recreate at home. We had the kids dress in Valentine’s Day colors of pink and red, then created three different white backdrops that would make them stand out. 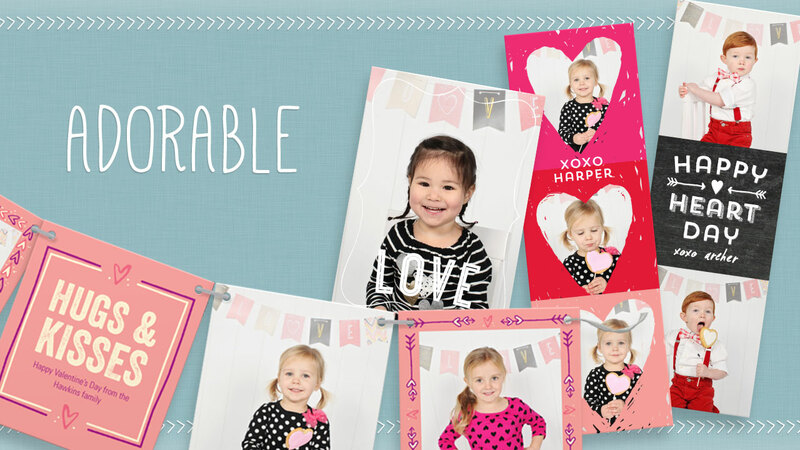 Then we put the photos in our favorite new Valentine’s Day cards to see how they’d look! 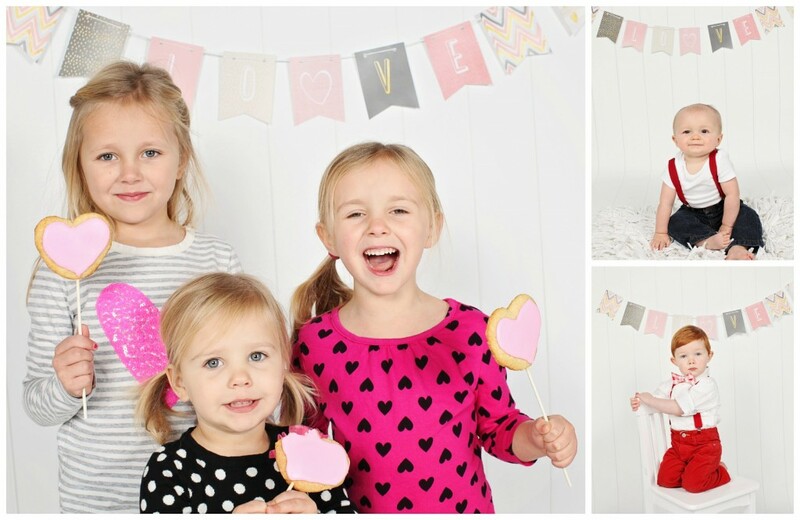 We chose a blank white wall and draped a simple banner across the top, made from our free Valentine’s Day printable. Set a chair or fluffy rug in front of it for kids to sit on and you’ve got yourself a set for the photo shoot. Props like heart-shaped suckers are sure to bring smiles. 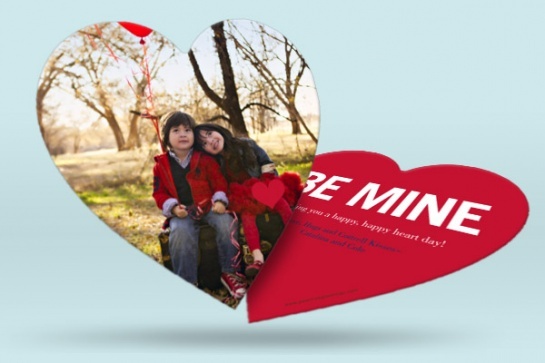 Happy Valentine’s Day from the kids at Pear Tree Greetings! 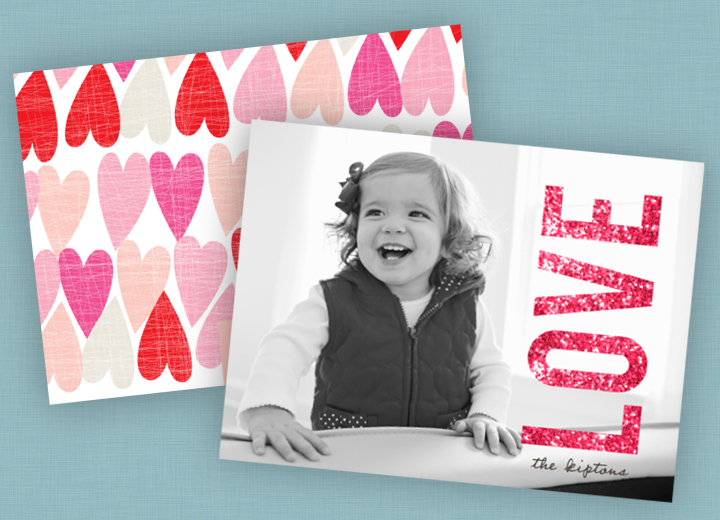 What a difference a good photo makes when you’re trying to pick your favorite Valentine’s Day card ideas! 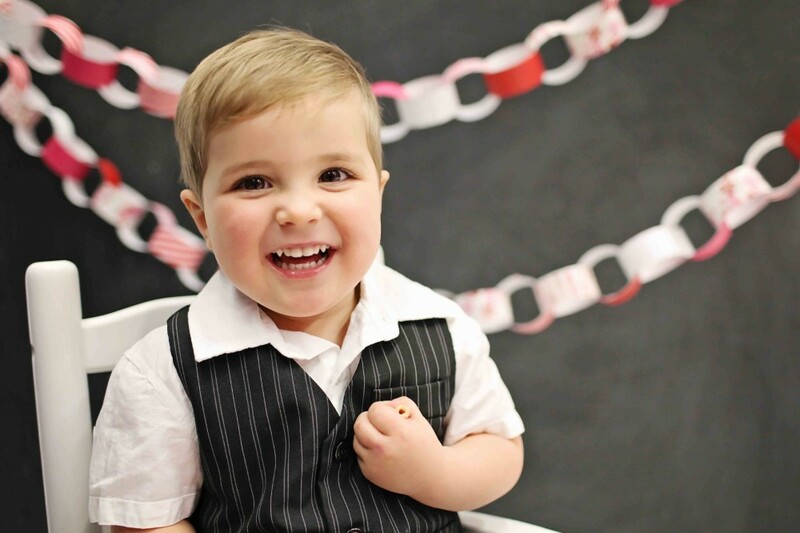 This adorable valentine caught our eye because the photo is just perfect for the card. Brooke, this little girl’s mom, agrees and adds that the card is also perfect for the family. Now here are some photography tips and ideas to help you achieve the actual photos you saw in the video. For our main background, we painted a 4×4 section of plywood with chalkboard paint. Chalkboard paint wasn’t entirely necessary since we didn’t write on it, we just liked the black background against our garland. And speaking of the garland, you can get it as a free printable! It’s easy to cut out and a fun activity to do with your kids. Photography Tip: Try placing something on your head and asking the child to blow it off. Just about anything works. I used a paper heart. It should either be something the child will physically be able to blow off, or that with a slight tilt of your head, they’ll think they did! Also setting the child on a box or a crate typically keeps them in one spot, long enough at least for a few quick photos! For this background, we used two sets of gold metallic curtains, right on top of each other. Inexpensive, and they come in many colors! 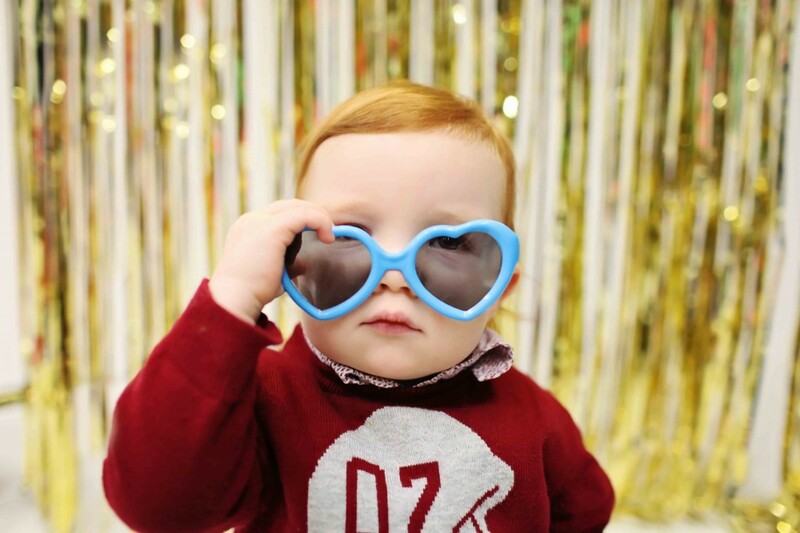 Photography Tip: Giving kids a prop like sunglasses allows them to interact and play with something, which keeps them occupied long enough for photos. And even the motions of taking off the glasses can be really cute! 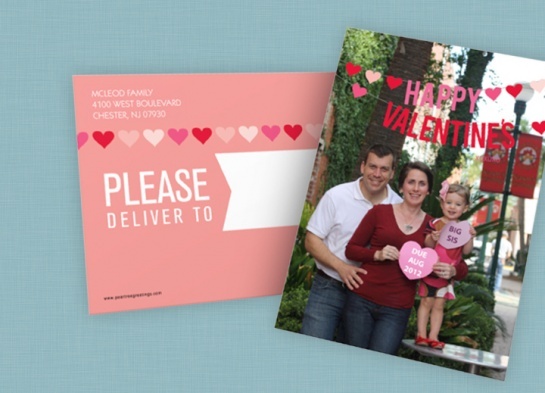 This Valentine’s Day photo card will be a big surprise for the family and friends of this soon-to-be family of four. They decided to use one of our heart-filled Valentine photo card ideas to announce a new baby on the way. 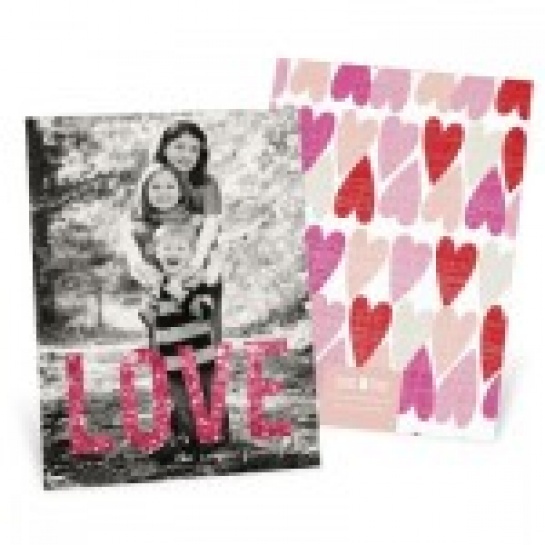 Are you planning to send valentine cards that friends and family will love? Then you should spend a little time thinking about valentine photo ideas, first. There is one simple thing you can do to make your photos pop: use props! 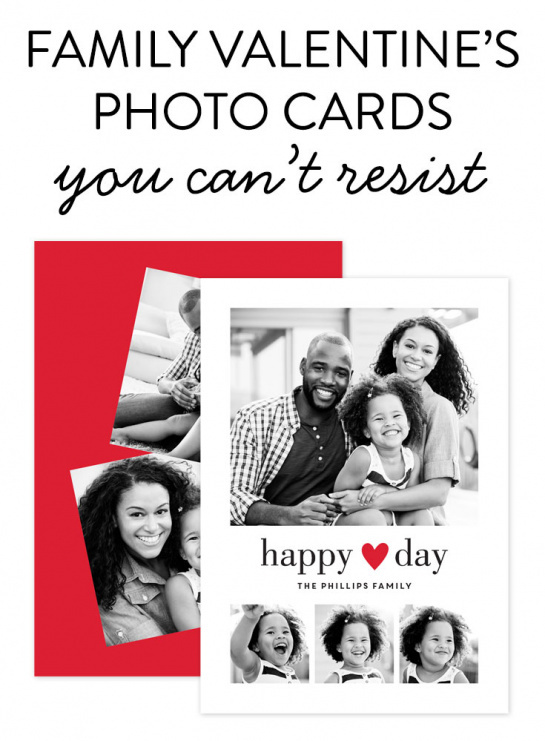 Since most Valentine’s Day photo cards share a palette of pinks and reds, adding a shot of pink or red to your photo is a fun way to tie your photo into the card design. A cute prop, such as a big candy heart or a flower that matches the colors in your card, makes it look like the card and photo were meant for each other.